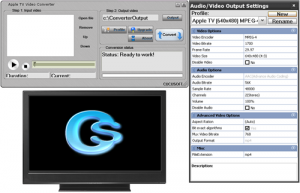 Cucusoft Apple TV Movie/Video Converter is the easiest to use video converter software available. It can convert almost any video format to play on your Apple TV, e.g. DivX, XviD, MOV, RM, rmvb, MPEG, WMV, AVI to Apple TV Movie / Apple TV Video format. It is a powerful Apple TV Video converter with a fast conversion speed. The output also supports full screen viewing. • Supports almost every video file format like DivX, XviD, MOV, dvr-ms, rm, rmvb, MPEG, WMV, AVI to Apple TV video (MP4 format). • Supports "Drag and Drop" interface to add video files. • Cool UI skin available and easy to use. • Supports Video to iPod as well. • Windows 9x, Windows 2000, Windows NT, Windows XP, Windows Vista, Windows 2003 Server, etc.